One of the interesting features that supports when both the Lync server and Exchange server are on 2013 platform, is the Unified Contact Store. 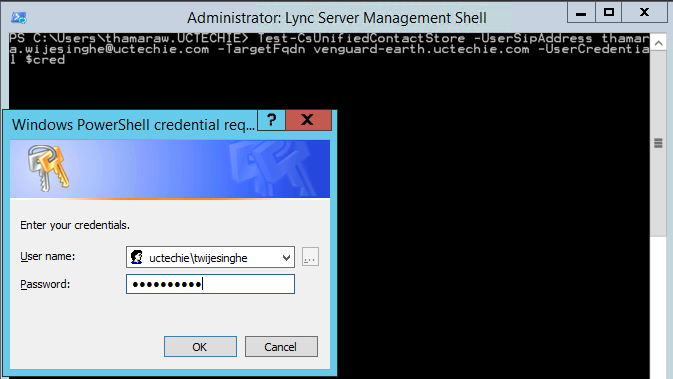 The purpose of the UCS is that to store a Lync enabled user’s contact in Exchange server instead of Lync server it self. One of the other benefit is that, to use Outlook to manage contacts instead of Lync 2013 client. After configuring UCS and enabling UCS for a user account, the default contact list provider will change to UCS as shown below. From that point onwards, the contact list if uploaded to Exchange server and will be managed by Exchange. Going in to the configuration, the first step would be to configure the server to server authentication (oAuth) between Exchange server and Lync server. It must require a certificate that issued by a trusted issuing provider and configuring each other as partner application. I have covered the certificate configuration steps in a previous article that described configuring integration between OWA and Lync server 2013. If this integration is in place, likely possibility is that the certificate configuration is already done. Else, you need to make sure that the Lync servers and Exchangers servers are having certificate that must be issued by a trusted issuing authority or an internal root certificate authority. It will not going to work if the Exchange is on self signed certificate. Once done, restart the IIS services on the CAS server and we are done with Exchange. That’s all there is to do with the server side configuration. Now to enable UCS for clients and do some testing. UCS configuration is there inside the “UserServicePolicy”. Usually in a deployment there will be only “Default” user policy. It’s not recommended to go ahead and enable the UCS within the default policy. Best practice is to configure a custom policy and assign that to pilot users before rolling it up to production. To test the exchange connectivity, run the command Test-CsExStorageConnectivity with the user SIP URI. It might take some time to get the changes to reflect to exchange.